Believe it or not the Fourth of July is on the horizon. It is a busy week up here at 9,000 feet. Live music, lectures, parades and pancakes are all part of the fun. So get out and enjoy a summer holiday week in Crested Butte! But remember that there is a fire ban in place throughout the county. So no outdoor campfires or even smoking in the backcountry is allowed. It is pretty crispy out there so be careful! Former Crested Butte Titan athlete and current New Balance professional runner Emma Coburn just won her seventh national title in the 3,000-meter steeplechase at the USTAF championships last weekend edging out the win with a time of 9:17.70. The Crested Butte Mountain Theater, in collaboration with the Crested Butte Library, will host Drag Your Butte to the Fabulous Cabaret on Friday, June 29 at the Mallardi Cabaret Theater. A night of fabulous fun, this event is 21+ and costumes are encouraged. Your Drag Queens for the evening are Coco Jem Holiday, Donatella Mysecrets, and Nina Symone from Grand Junction. Tickets are available online at www.cbmountaintheater.org, for $18 online presale, $20 cash at the door. 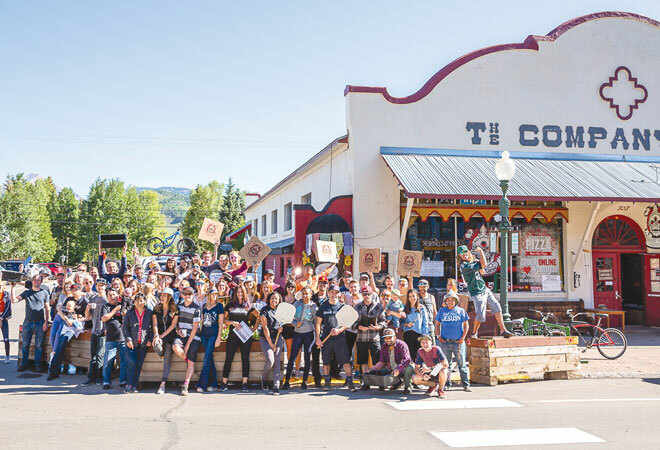 Doors open at 8 p.m., and the show begins at 9 p.m.
Join the Crested Butte Mountain Heritage Museum for the 16th Annual Black & White Ball on Saturday, June 30, from 6 to 10 p.m. Once again, you will see tents up for this annual block party on the corner of Fourth Street and Elk Avenue. Listen to the New Mexico-based Americana Zydeco band Felix y Los Gatos as you enjoy appetizers provided by Ayla and Ian Scott’s Grease and Glitter Catering. Tickets for members are $25 and non-members $30. You can buy event tickets online at crestedbuttemuseum.com or by calling the museum at 349-1880. Mountain Gazette Author Jane Parnell to read and sign at Townie Books on Saturday June 30th at 4pm. Jane Parnell’s Off Trail: Finding My Way Home in the Colorado Rockies is an inspiring memoir about surmounting challenges, including the highest peaks in the Colorado Rockies. 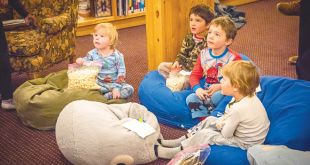 A special Storytime Event is also happening Saturday. BEES will be at 10:30 a.m. on Saturday, June 30 at Townie Books. To reserve your spot call (970) 349-7545. Get yourself a cocktail and settle in for an evening of song and dance—ranging from spicy to sweet, naughty to very nice—in a cabaret setting at the Gunnison Arts Center, for “Sugar and Spice, Naughty and Nice,” June 29 and 30. Doors open at 7:30, and the curtain goes up at 8 p.m. You’ll laugh and love this locally produced talent held in the GAC Dance Studio, cabaret style. Directed by Enid Holden, with accompaniment by Julia Wilson, and MC by William Spicer. Appropriate for ages 18+. Tickets are $20 per person. 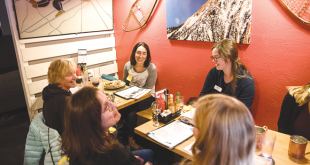 STASH STAFF: The Secret Stash has a large staff for the summer, but like most local businesses, is still seeking employees to meet the busy demands. 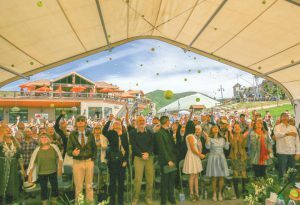 CELEBRATION OF LIFE: Friends, family, and community came together to celebrate the amazing life of Tom Stillo as a photographer, volleyball legend, skier, avid tennis and pickle ball player. 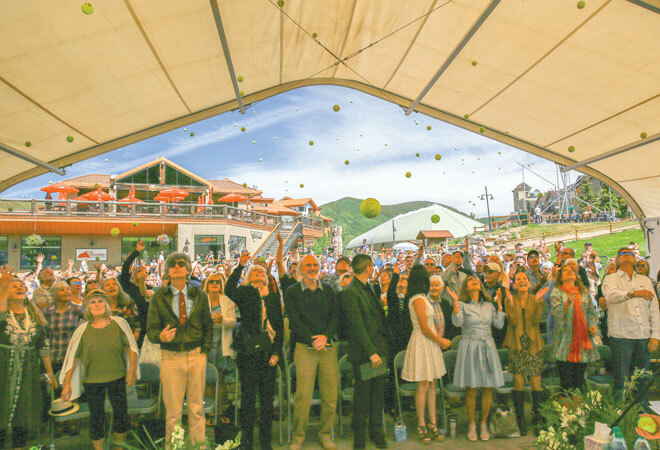 The ceremony was held on Saturday, June 23 at the Crested Butte Mountain Resort Base Area and included celebrants throwing personalized tennis balls into the air. 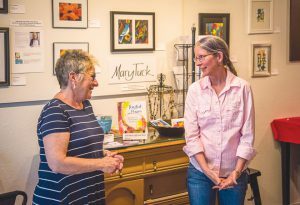 THE ART STUDIO: Along with multiple other art galleries, The Art Studio hosted a reception for some local artists on Saturday, June 23rd. 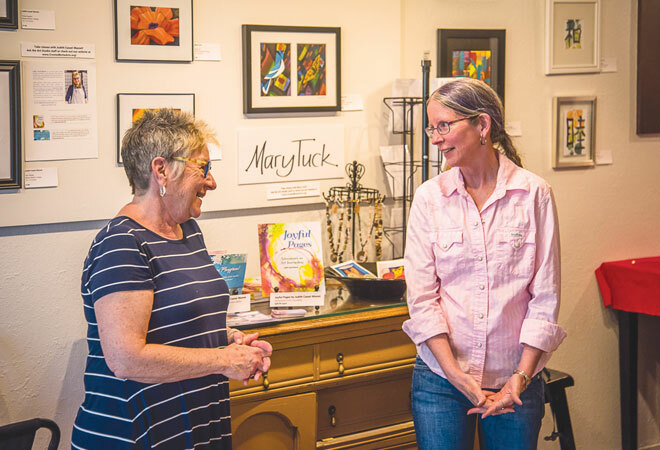 Pictured above are artists Laura Elm (left), Peggy Morgan Stenmark (middle), and Judith Cassel-Mamet (Right). Cameos: How are you celebrating independence day? Toasting the fireworks in Oklahoma.